Patients with sepsis are at increased risk of stroke or myocardial infarction (heart attack) in the first 4 weeks after hospital discharge, according to a large study. Patients with sepsis are at increased risk of stroke or myocardial infarction (heart attack) in the first 4 weeks after hospital discharge, according to a large Taiwanese study. Researchers looked at data on more than 1 million people in Taiwan, of whom 42,316 patients had sepsis, matched with control patients in the hospital and the general population. All sepsis patients had at least one organ dysfunction, 35% were in the intensive care unit and 22% died within 30 days of admission. 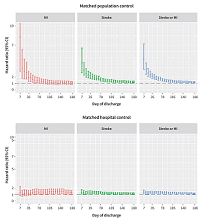 In the total group of patients with sepsis, 1012 had a cardiovascular event, 831 had a stroke and 184 had a myocardial infarction within 180 days of discharge from hospital. Risk was highest in the first 7 days after discharge, with more than one-quarter (26%) of myocardial infarction or stroke occurring in the immediate period and 51% occurring within 35 days. Illustration: Risk profile over time of myocardial infarction and stroke in participants after discharge from hospital. Comparison of participants with sepsis with participants without sepsis in the population control group (upper panel). Comparison of participants with sepsis with participants without sepsis in the hospital control group (lower panel). Note: CI = confidence interval, MI = myocardial infarction. Canadian Medical Association Journal.